[Expired] Black Friday Sale – 2017! In September, we decided to run an “End of Summer Sale” which has proven to have been very popular and due to all of the requests, we decided to use the very same sale as our “BLACK FRIDAY” Sale. Due to our success with this sale, others have since tried to copy us, but those other grids cannot offer the same level of performance or support you will find at DigiWorldz! These deals are a great way to to buy land on the DigiWorldz grid and includes all of the features and support our users have come to expect from DigiWorldz. – Buy any “Standard” 256m x 256m region and receive a second region FREE! 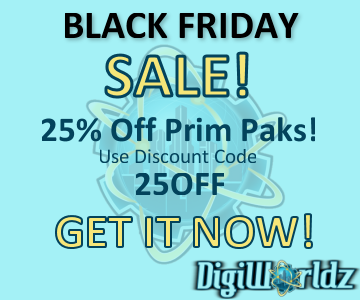 – Buy any Prim Package and receive a 25% discount! No “Double Dipping”.. meaning you cannot combine theses deals with any others. These prices will remain in effect for your regions and/or Prim Paks for as long as you pay the bill. When ordering your region, please tell us the Name of the Free region, and the estate name if different from the first, and where you want it located, we’ll handle the rest. The last day for this sale will be either December 31st, or once we hit 50 sales (100 total regions), so don’t wait, or they may be gone.